Want to learn how to pour lead head jigs? We’ve got a great tutorial for you! Pouring your own lead head jigs is easy, fun and will save you a ton of money when compared to buying jigs at the store. And when you pour your own lead head jigs, you can make them in the styles, sizes and color combinations that you prefer. First, you’ll need to decide what style lead head jig you want to make. There are dozens of choices, ranging from ball head to minnow head to pony head and everything in between. 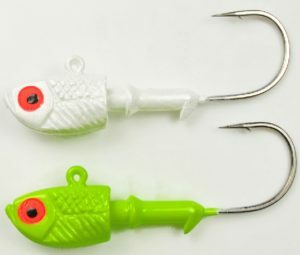 The video in this blog post is using a mold for shad head jigs, which are typically used for bigger fish, such as striped bass. But the sky is the limit, so choose whatever works for you! Once you’ve chosen your jig head style, you’ll need to pick up a good mold to pour them with. You’ll also need a good lead melting pot to heat the lead with. And to finish it off, you’ll need a good jig hook that matches the mold you’re using. Now that you’ve got everything you need with regard to components, it’s time to start pouring. So, you’ll need to grab your mold, your hooks and some lead ingots and set about the business of making jig heads! If you’re not familiar with pouring your own lead, the video below has some great tips. There are practical things that you’ll learn from the video. There are also some very good safety tips you should pay close attention to. For example, be sure to use extreme caution when it comes to handling hot lead and a hot mold. Leather gloves are necessary in order to prevent burns to your hands. You’ll also want to protect your eyes when pouring hot lead. After the jig heads have been poured, they only take a few seconds to harden. So go ahead and open your mold up and remove the new jig heads and remove them from the mold. Continue to pour until you have the desired number of jig heads. Painting your new jig heads with powder paint is extremely easy to do. You can choose to paint directly from the container that the powder paint comes in. Or you can use a fluid bed, which causes the powder paint to stay light and fluffy. This gives you a more even coat when dipping hot jigs in it. Use a candle or a heat gun to heat your new lead head jigs before dipping them in the powder paint. Word of warning; DO NOT use a propane torch to heat your jig heads. Doing so will most likely result in your jig heads melting and being rendered useless. After you’ve painted a bunch of heads, be sure to put them in an oven, or a toaster oven, to cure the paint and keep it hard. This will give the paint a rock-hard finish that will resist chipping when bouncing it off rocks, etc. Now that the jig head is poured and the paint is cured, it’s time to put the eyes on! Good 3D eyes will add a realistic touch to your jig heads that can get finicky fish to bite, when they might not otherwise give your lure a second glance. These types of eyes simply peel off a sheet and stick to your lure. Plain and simple. To keep them in place, use some good top coat to seal everything and give the entire bait a tough finish that will take a beating from big fish and rocky cover. This will also keep the eyes in place for the life of the jig head. So there you have it. How to pour lead head jigs in a few simple steps! We hope you have learned enough from this post about how to pour lead head jigs to get you comfortable with it. Be sure to give the video below a watch. It’s well done and should get you well on your way to pouring your own lead head jigs in no time at all. 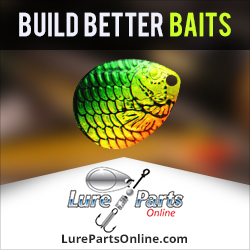 This entry was posted in Pouring Lead Lures and tagged how to make lead head jigs, how to pour lead head jigs, how to pour lead lurees, how to pour leadhead jigs, how to pour your own lead head jigs, pour your own leadhead jigs on August 30, 2017 by Lure Parts Online.